Grown widely as a culinary plant as well as an ornamental Lemongrass is widely used in Asian cooking where it imparts a distinctive flavour to many dishes. Generally the stalk is crushed, used in cooking and discarded rather then eaten. It is also used to make a tea, the essential oils are extracted and are used in perfumes and other fragrant products. You can grow Lemon grass in the home garden, and the fresh product is regarded as superior. The botanical name is Cymbopogon citratus and it is also used as a component for insect repellants. It will reach around 1m in height in good conditions. Although it is seen as a tropical plant, you can easily grow your own Lemon grass in cooler climates as far south as Melbourne. All you need is a sunny position and a good moist soil through summer. Lemon Grass (Cymbopogon citratus ) is mainly used as a culinary herb, as a flavouring in asian cooking, as a tea (lemon grass tea) as an insect repellant and also as a garden plant. It will reach around 1m in height in good conditions. Growing in large clumps, fresh lemon grass is harvested by puling a stalk from the clump. The part that is regarded as the ‘best’ is the pale white part close to the root. As this is a fibrous plant it is always sliced very finely when added to recipes. Dried lemon grass must be thoroughly soaked before using. The tender white stalks are used for cooking, the rest can be used for lemon grass tea. Great with fish and chicken dishes. This is actually drought resistant once established. It is a clumping plant growing up to 1m, try a humus rich well drained moist soil. Use as a border for the vegetable garden. Propagation is by division of established clumps. 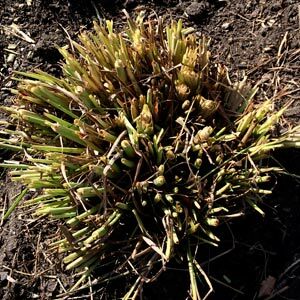 Simply dig up the clump and divide it into 3-4 smaller clumps, depending on size. Trim the foliage back to around 10cm and then replant. Lemon Grass grows well in a humus rich moist soil in full sun. Prepare the soil well digging in some well rotted compost. Plant the young lemon grass and then water in well with a liquid seaweed fertilizer. You can sneak a few shoots out when needed, however the best time to harvest is from early to mid summer through to autumn. It can be pruned back in winter to promote new growth, simply prune back to just above ground level making sure that this above any new shoots. Lemon grass will need dividing after a year or two to promote vigour.